For other uses, see Caper (disambiguation). 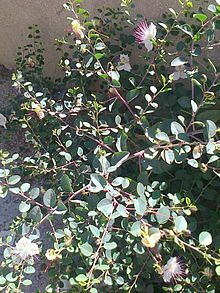 Capparis spinosa, the caper bush, also called Flinders rose, is a perennial plant that bears rounded, fleshy leaves and large white to pinkish-white flowers. Blumea grandiflora Zipp. ex Span. Capparis murrayi Stewart ex Dalz. The plant is best known for the edible flower buds (capers), often used as a seasoning, and the fruit (caper berries), both of which are usually consumed pickled. Other species of Capparis are also picked along with C. spinosa for their buds or fruits. Other parts of Capparis plants are used in the manufacture of medicines and cosmetics. Capparis spinosa is native to the Mediterranean. It is endemic to almost all the circum-Mediterranean countries, and is included in the flora of most of them, but whether it is indigenous to this region is uncertain. Although the flora of the Mediterranean region has considerable endemism, the caper bush could have originated in the tropics, and later been naturalized to the Mediterranean basin. The taxonomic status of the species is controversial and unsettled. Species within the genus Capparis are highly variable, and interspecific hybrids have been common throughout the evolutionary history of the genus. As a result, some authors have considered C. spinosa to be composed of multiple distinct species, others that the taxon is a single species with multiple varieties or subspecies, or that the taxon C. spinosa is a hybrid between C. orientalis and C. sicula. The shrubby plant is many-branched, with alternate leaves, thick and shiny, round to ovate. The flowers are complete, sweetly fragrant, and showy, with four sepals and four white to pinkish-white petals, and many long violet-colored stamens, and a single stigma usually rising well above the stamens. The caper bush requires a semiarid or arid climate. The caper bush has developed a series of mechanisms that reduce the impact of high radiation levels, high daily temperature, and insufficient soil water during its growing period. The caper bush has a curious reaction to sudden increases in humidity; it forms wart-like pock marks across the leaf surface. This is apparently harmless, as the plant quickly adjusts to the new conditions and produces unaffected leaves. It also shows characteristics of a plant adapted to poor soils. This shrub has a high root/shoot ratio and the presence of mycorrhizae serves to maximize the uptake of minerals in poor soils. Different nitrogen-fixing bacterial strains have been isolated from the caper bush rhizosphere, playing a role in maintaining high reserves of that growth-limiting element. The caper bush has been introduced as a specialized culture in some European countries in the last four decades. The economic importance of the caper plant led to a significant increase in both the area under cultivation and production levels during the late 1980s. The main production areas are in harsh environments found in Morocco, the southeastern Iberian Peninsula, Turkey, and the Italian islands of Pantelleria and Aeolian Islands, especially Salina. This species has developed special mechanisms to survive in the Mediterranean conditions, and introduction in semiarid lands may help to prevent the disruption of the equilibrium of those fragile ecosystems. A harvest duration of at least three months is necessary for profitability. [clarification needed] Intense daylight and a long growing period are necessary to secure high yields. The caper bush can withstand temperatures over 40 °C in summer, but it is sensitive to frost during its vegetative period. A caper bush is able to survive low temperatures in the form of stump, as happens in the foothills of the Alps. Caper plants are found even 3,500 m above sea level in Ladakh, though they are usually grown at lower altitudes. Some Italian and Argentine plantings can withstand strong winds without problems, due to caper bush decumbent architecture and the coriaceous consistency of the leaves in some populations. Scientists can use the known distributions of each species to identify the origin of commercially prepared capers. The caper bush is a rupicolous species. It is widespread on rocky areas and is grown on different soil associations, including alfisols, regosols, and lithosols. In different Himalayan locations, C. spinosa tolerates both silty clay and sandy, rocky, or gravelly surface soils, with less than 1% organic matter. It grows on bare rocks, crevices, cracks, and sand dunes in Pakistan, in dry calcareous escarpments of the Adriatic region, in dry coastal ecosystems of Egypt, Libya, and Tunisia, in transitional zones between the littoral salt marsh and the coastal deserts of the Asian Red Sea coast, in the rocky arid bottoms of the Jordan valley, in calcareous sandstone cliffs at Ramat Aviv, Israel, and in central west and northwest coastal dunes of Australia. It grows spontaneously in wall joints of antique Roman fortresses, on the Western Wall of Jerusalem's Temple Mount, and on the ramparts of the castle of Santa Bárbara (Alicante, Spain). Clinging caper plants are dominant on the medieval limestone-made ramparts of Alcudia and the bastions of Palma (Majorca, Spain). This aggressive pioneering has brought about serious problems for the protection of monuments. Capers can be grown easily from fresh seeds gathered from ripe fruit and planted into well-drained seed-raising mix. Seedlings appear in two to four weeks. Old, stored seeds enter a state of dormancy and require cold stratification to germinate. The viable embryos germinate within three to four days after partial removal of the lignified seed coats. The seed coats and the mucilage surrounding the seeds may be ecological adaptations to avoid water loss and conserve seed viability during the dry season. Use of stem cuttings avoids high variability in terms of production and quality. Nevertheless, plants grown from cuttings are more susceptible to drought during the first years after planting. The caper bush is a difficult-to-root woody species, and successful propagation requires careful consideration of biotypes and seasonal and environmental parameters. Rootings up to 55% are possible when using one-year-old wood, depending on cutting harvest time and substrate used. Propagation from stem cuttings is the standard method for growing ‘Mallorquina’ and ‘Italiana’ in Spain, and ‘Nocella’ in the Aolian Islands, esp. Salina. Hardwood cuttings vary in length from 15 to 50 cm and diameter of the cuttings may range from 1.0 to 2.5 cm. Another possibility is to collect stems during February through the beginning of March, treat them with captan or captafol and stratify them outdoors or in a chamber at 3–4 °C, covered with sand or plastic. Moisture content and drainage should be carefully monitored and maintained until planting. Using semihardwood cuttings, collected and planted during August and September, low survival rates (under 30%) have been achieved. Softwood cuttings are prepared in April from 25- to 30-day shoots. Each cutting should contain at least two nodes and be six to 10 cm long. Basal or subterminal cuttings are more successful than terminal ones. Then, cuttings are planted in a greenhouse under a mist system with bottom heat; 150 to 200 cuttings/m2 may be planted. Mean annual temperatures in areas under cultivation are over 14 °C and rainfall varies from 200 mm/year in Spain to 460 mm/year in Pantelleria and 680 mm/year in Salina. In Pantelleria, it rains only 35 mm from May through August, and 84 mm in Salina, the Aeolian Islands. A rainy spring and a hot dry summer are considered advantageous. This drought-tolerant perennial plant is used for landscaping and reducing erosion along highways, steep rocky slopes, sand dunes or fragile semiarid ecosystems. Caper plantings over 25 to 30 years old are still productive. Thus, physical properties of the soil (texture and depth) are particularly important. Caper bushes can develop extensive root systems and grow best on deep, nonstratified, medium-textured, loamy soils. Mouldboard plowing and harrowing are usual practices prior to caper plant establishment. Soil-profile modification practices, such as deep plowing operating 0.6 to 1 m, can ameliorate some restrictions. In Pantelleria, digging backhoe pits for each shrub was found to be the most effective means of cultivating caper in rocky soils. Two planting designs are used, the square/rectangle and the hedgerow system. Spacing is determined by the vigour of the biotype, fertility of the soil, equipment used and the irrigation method, if any. Bush spacing of 2.5 × 2.5 m or 2.5 × 2 m is common in Pantelleria. In Salina, the Aeolian Islands, 3 × 3 m is satisfactory for ‘Nocella’. In Spain, 4 × 4 m or 5 × 5 m is satisfactory for ‘Mallorquina’. Spacing of 2.0 to 2.5 m is appropriate if C. spinosa is used to control soil erosion on slopes. Caper buds are usually picked in the morning. Because the youngest, smallest buds fetch the highest prices, daily picking is typical. Capers may be harvested from wild plants, in which case it is necessary to know that the plant is not one of the few poisonous Capparis species that look similar. The plant normally has curved thorns that may scratch the people who harvest the buds, although a few spineless varieties have been developed. 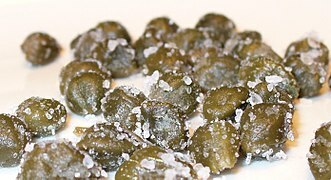 The salted and pickled caper bud (called simply a caper) is often used as a seasoning or garnish. Capers are a common ingredient in Mediterranean cuisine, especially Cypriot, Italian, Aeolian and Maltese. The mature fruit of the caper shrub are prepared similarly and marketed as caper berries. The buds, when ready to pick, are a dark olive green and about the size of a fresh kernel of corn (Zea mays). They are picked, then pickled in salt, or a salt and vinegar solution, and drained. Intense flavor, sometimes described as being similar to black pepper or mustard, is developed as mustard oil (glucocapparin) is released from each caper bud. This enzymatic reaction leads to the formation of rutin, often seen as crystallized white spots on the surfaces of individual caper buds. Capers are a distinctive ingredient in Italian cuisine, especially in Sicilian, Aeolian and southern Italian cooking. They are commonly used in salads, pasta salads, meat dishes, and pasta sauces. Examples of uses in Italian cuisine are chicken piccata and spaghetti alla puttanesca. Capers are one of the ingredients of tartar sauce. They are often served with cold smoked salmon or cured salmon dishes (especially lox and cream cheese). Capers and caper berries are sometimes substituted for olives to garnish a martini. Capers are categorized and sold by their size, defined as follows, with the smallest sizes being the most desirable: non-pareil (up to 7 mm), surfines (7–8 mm), capucines (8–9 mm), capotes (9–11 mm), fines (11–13 mm), and grusas (14+ mm). If the caper bud is not picked, it flowers and produces a caper berry. The fruit can be pickled and then served as a Greek mezze. Caper leaves, which are hard to find outside of Greece or Cyprus, are used particularly in salads and fish dishes. They are pickled or boiled and preserved in jars with brine—like caper buds. Dried caper leaves are also used as a substitute for rennet in the manufacturing of high-quality cheese. Caper leaves, pickled or boiled, can be used as an addition to salads. Canned, pickled capers are 84% water, 5% carbohydrates, 2% protein, and 1% fat (table). Preserved capers are often particularly high in sodium content. In a typical serving of 28 grams (one ounce), capers supply 6 calories and 35% of the Daily Value (DV) for sodium, with no other nutrients in significant content. In a 100 gram amount, the sodium content is 2960 mg or 197% DV, with vitamin K (23% DV), iron (13% DV), and riboflavin (12% DV) also having appreciable levels (table). Capers are sometimes used in cosmetics. Canned capers contain polyphenols, including the flavonoids quercetin (173 mg per 100 g) and kaempferol (131 mg per 100 g), as well as anthocyanins. The caper was used in ancient Greece as a carminative. It is represented in archaeological levels in the form of carbonised seeds and rarely as flower buds and fruits from archaic and Classical antiquity contexts. Athenaeus in Deipnosophistae pays a lot of attention to the caper, as do Pliny (NH XIX, XLVIII.163) and Theophrastus. 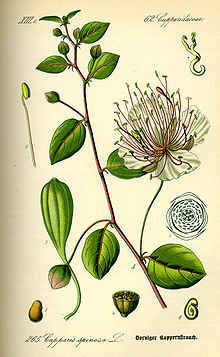 Etymologically, the caper and its relatives in several European tongues can be traced back to Classical Latin capparis, “caper”, in turn borrowed from the Greek κάππαρις, kápparis, whose origin (as that of the plant) is unknown but is probably Asian. Another theory links kápparis to the name of the island of Cyprus (Κύπρος, Kýpros), where capers grow abundantly. In Biblical times, the caper berry was apparently supposed to have aphrodisiac properties; the Hebrew word aviyyonah (אֲבִיּוֹנָה) for caperberry is closely linked to the Hebrew root אבה (avah), meaning "desire". The word occurs once in the Bible, in the book of Ecclesiastes, at verse 12:5. Of other modern versions, the NIV goes for "desire" (12:5 NIV), while the NASB has "caper-berry" (12:5 NASB), as did the 1917 Jewish Publication Society version (12:5 JPS). The berries (abiyyonot) were eaten, as appears from their liability to tithes and to the restrictions of the 'Orlah. They are carefully distinguished in the Mishnah and the Talmud from the caper leaves, alin, shoots, temarot, and the caper buds, capperisin (note the similarity "caper"isin to "caper"); all of which were eaten as seen from the blessing requirement, and declared to be the fruit of the ẓelaf or caper plant. Talmud Bavli, Gemara Berachot, page 36 A&B, discusses the eating of caper sepals versus caper berries, both inside the land of Israel, outside the land of Israel, and in Syria. Capers are mentioned as a spice in the Roman cookbook, Apicius. Nasturtium, marigold, and Cassia buds have sometimes been used as a substitute. ^ "Capparis spinosa". Germplasm Resources Information Network (GRIN). Agricultural Research Service (ARS), United States Department of Agriculture (USDA). Retrieved 11 December 2017. ^ Flora of China, 山柑 shan gan, Capparis spinosa Linnaeus, Sp. Pl. 1: 503. 1753. ^ Australia, Atlas of Living. "Capparis spinosa". bie.ala.org.au. ^ Pugnaire, F (1989). "Nota sobre las Capparaceae ibéricas". Blancoana. 7: 121–122. ^ Jacobs, M. 1965 The genus Capparis (Capparaceae) from the Indus to the Pacific. Blumea, 12, 385–541. ^ D. Rivera, C. Inocencio, C. Obón, E. Carreño, A. Reales, F. Alcaraz. 2002 "Archaeobotany of capers (Capparis) (Capparaceae)" Vegetation History and Archaeobotany, 11:4. ^ Levizou, E; P Drilias; Kyparissis, A. (2004) Exceptional photosynthetic performance of Capparis spinosa L. under adverse conditions of Mediterranean summer. Photosynthetica 42, 229–235. ^ Pugnaire, FI; E Esteban (1990). "Nutritional adaptations of caper shrub (Capparis ovata Desf.) to environmental stress". Journal of Plant Nutrition. 14 (2): 151–161. doi:10.1080/01904169109364191. ^ Andrade, G; E Esteban; L Velasco; MJ Lorite; EJ Bedmar (1997). "Isolation and identification of N2-fixing microorganisms from the rhizosphere of Capparis spinosa (L.)". Plant and Soil. 197 (1): 19–23. doi:10.1023/A:1004211909641. ^ Sozzi, GO (2001). Caper bush: botany and horticulture. Horticultural Reviews. 27. John Wiley & Sons. pp. 125–188. doi:10.1002/9780470650813.ch4. ISBN 978-0470650813. ^ Fici, S (October 2001). "Intraspecific variation and evolutionary trends in Capparis spinosa L. (Capparaceae)". Plant Systematics and Evolution. 228 (3–4): 123–141. doi:10.1007/s006060170024. ^ Inocencio, C; F Alcaraz; F Calderón; C Obón; D Rivera (April 2002). "The use of floral characters in Capparis sect. Capparis' to determine the botanical and geographical origin of capers". European Food Research and Technology. 214 (4): 335–339. doi:10.1007/s00217-001-0465-y. ^ Sozzi, G O (2008). Capparis spinosa, caper bush, pp. 227-232. In: J Janick and RE Paull (Eds. ), The Encyclopedia of Fruit and Nuts. CABI Publishing, Oxfordshire, United Kingdom. ^ Sozzi, GO; A Chiesa (June 1995). "Improvement of caper (Capparis spinosa L.) seed germination by breaking seed coat-induced dormancy". Scientia Horticulturae. 62 (4): 255–261. doi:10.1016/0304-4238(95)00779-S.
^ Barbera, B. (1991). Le câprier (Capparis spp.). EUR 13617, Série Agriculture, Programme de recherche Agrimed. Commission des Communautés européennes, Luxembourg, 63 pp. ^ Luna Lorente, F; M Pérez Vicente (1985). La Tapenera o Alcaparra: Cultivo y Aprovechamiento. Publicaciones de Extensión Agraria, Colección Agricultura Práctica 37. Ministerio de Agricultura, Pesca y Alimentación, Madrid, España, 125 pp. ^ a b c d e f g h Small, Ernest (2011-08-23). Top 100 Exotic Food Plants. Boca Raton, Florida: CRC Press. pp. 121–123. ISBN 978-1439856888. ^ "USDA Database for the Flavonoid Content of Selected Foods, Release 3, page 16" (PDF). US Department of Agriculture. 2011. Archived from the original (PDF) on 16 July 2012. Retrieved 12 July 2016. ^ Mansour, R. B.; Jilani, I. B.; Bouaziz, M; Gargouri, B; Elloumi, N; Attia, H; Ghrabi-Gammar, Z; Lassoued, S (2016). "Phenolic contents and antioxidant activity of ethanolic extract of Capparis spinosa". Cytotechnology. 68 (1): 135–42. doi:10.1007/s10616-014-9764-6. PMC 4698273. PMID 25377263. ^ Gernot Katzer. "Spice Pages: Capers (Capparis spinosa)". gernot-katzers-spice-pages.com. ^ Though, as the Jewish Encyclopedia points out, the female form aviyyonah should strictly mean "the desiring thing", rather than "desire" itself. Kimhi suggested "soul". Wikisource has the text of the 1911 Encyclopædia Britannica article Capers. Book. "Capers. From Wild Harvest to Gourmet Food". Brian Noone 2017 Published by Caperplants.